Roughly once each day, somewhere in the sky, there is an enormous burst of energy lasting sometimes only for mere seconds but at other times for several minutes. Professor George Simnett from Birmingham University told us the story of how astronomers are finally starting to understand what causes these mysterious events and where they come from. The intense flashes have been named "gamma-ray bursts" or "GRB" as the pulses consist mainly of gamma rays. This type of radiation is similar to the X-rays that are used by doctors to check for broken bones but gamma rays have even more energy and can do considerable damage to human tissue. Luckily for us (and the rest of life on Earth) atmospheric gases block out the gamma rays before they reach us. If we were able to see them they would appear as brilliant points of light millions of times brighter than our Sun. They occur randomly across the whole of the sky and ever since their discovery back in 1967 by a military satellite called Vela the sheer power of these bursts has puzzled scientists. The Vela satellites were not looking for these strange phenomena but were launched as orbital watchdogs intended to enforce the Nuclear Test Ban Treaty, as nuclear explosions have a telltale signature of gamma rays. The bursts can be split into two distinct types: long-duration and short-duration with a cut-off point at around 2 seconds. The longer bursts originate at the farthest edges of the Universe, typically billions of light-years away. These GRB started out on their journey when the Earth was still very young, before the first microbes or even the oceans has started to form. The long-duration GRB are thought to occur when a huge star dies and collapses in on itself, producing an explosion called a "hypernova". This collapse is so violent that almost inevitably a black hole will then form. Short-duration GRB are more of a puzzle. At the moment there is no consensus as to what causes these shorter bursts. Various theories have been proposed such as the collision of very dense stars known as neutron stars but more data needs to be gathered in order to confirm this. Today a worldwide network called the Gamma-ray Burst Coordinates Network (GCN) coordinates space-based observations and ground-based follow-through observations of GRB afterglow. In practice this means that dedicated spacecraft spot a GRB and then automatically contact other observatories to look for other emissions from the same spot. In this way data from the whole of the spectrum can be gathered from gamma rays to radio waves with visible light in between. 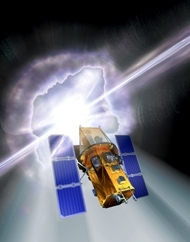 In mid 2005, NASA is planning to launch into orbit the Swift Gamma- Ray Burst Mission. It will be able to detect the bursts and then perform follow-up observations of the afterglow with X-ray, Ultraviolet and optical telescopes. These will automatically be pointed to a burst location within a minute that a GRB is detected.